Why Bernette Sewing is a passion and nothing is more satisfying than expressing this passion through your own creations. Are you bursting with ideas and looking for a sewing machine to inspire you to make your projects a reality? bernette machines are stylish, easy to use, have a large number of functions and are attractively priced. Creative sewing enjoyment at its best. Whether you simply shorten a pair of jeans now and then, want to embellish a blouse or whether you are looking for a sewing machine with embroidery functions that can be upgraded to suit your sewing needs - a bernette sewing machine is a good choice for you. No matter which model you choose, bernette machines will impress you with their versatility and reliability. 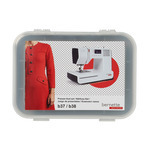 And because great emphasis is placed on the robustness and durability of their design, you will enjoy using your bernette for a long time: bernette sewing and embroidery machines look great and provide everything you need for your creative projects.